The subway is a good way to quickly get around the city and a traveler can easily figure it out through the station maps and English signs and language. Be warned that due to the decrease in ticket prices the network is extremely overcrowded right now, especially on line 1 and at rush hour. 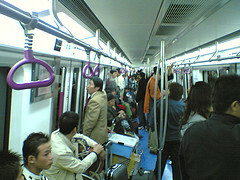 Beijing now has 14 subway lines by December 30, 2010. Most lines run parallel or perpendicular to each other and intersect at right angles. 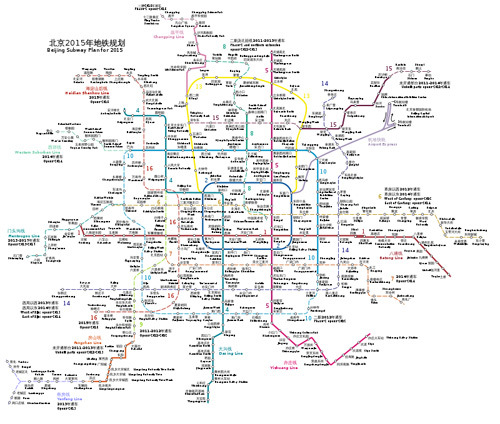 Click here to see the larger map of the Beijing Subway System. Line 1 runs in a straight line from the Western Hills through Tiananmen Square in the city centre to the eastern suburbs at Sihui. It follows Chang'an Avenue and connects major commercial centres, Xidan, Wangfujing, Dongdan and the Beijing CBD. Line 2, a rectangular loop line, traces the Ming-era city wall that once surrounded the inner city. Line 2 stops at each of the wall's 12 gates (ending in men), now busy intersections, as well as the Beijing Railway Station. 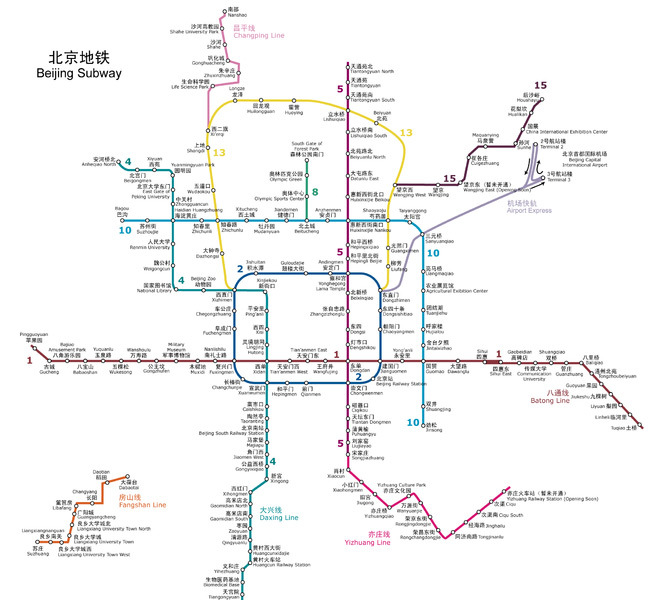 Line 4, a mainly north-south line running west of city centre with stops at the Summer Palace, Old Summer Palace, Peking and Renmin Universities, Zhongguancun Technology Park, National Library, Beijing Zoo, Xidan and Beijing South Railway Station. Line 5 runs in a straight north-south line just east of the city centre. It passes the Temple of the Earth, Lama Temple and the Temple of Heaven. Line 8, Phase I (Olympic Branch Line) extends straight north off of Line 10 with 3 stops in the Olympic Village. Line 10 forms an inverted "L"-shaped half-shell to the north and east of Line 2. In the north, it follows the Yuan-era city wall, passing south of the Olympic village. At the Sanyuanqiao stop northeast of the city, Line 10 turns straight south and follows the eastern 3rd Ring Road through the embassy district and Beijing CBD. Line 13 arcs across suburbs north of the city and channels commuters to Xizhimen and Dongzhimen, at the northwest and northeast corners of Line 2. Line 15 branches off Line 13 at Wangjing West and runs northeast to suburban Shunyi District. Line Batong runs from Line 1's eastern terminus at Sihui East to even more distant suburbs in Tongzhou District. Line Changping branches off Line 13 at Xi'erqi and runs north to suburban Changping District. Line Daxing extends Line 4 south to suburban Daxing District. Line Fangshan is currently a stand alone line in southwest Beijing that connects Dabaotai in Fengtai District with suburban Fangshan District. It will be linked to the subway network with the completion of Line 9 in 2012. Line Yizhuang extends from Line 5's southern terminus to the Yizhuang Economic & Technological Development Zone in the southeastern suburbs. Airport Express connects the Beijing Capital International Airport, 27 km northeast of the city, with Line 10 at Sanyuanqiao and Lines 2 and 13 at Dongzhimen. A map showing Beijing subway lines currently in operation (solid lines) and lines projected for completion before 2015. 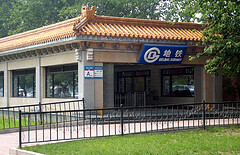 The subway station entrances are identified by a large blue stylized letter G wrapped around a smaller letter B. Purchase tickets at the window. Note that if you want two tickets, do not show your thumb and index finger, the Chinese way to signify numbers is different from the west, thumb and index finger mean eight not two. The subway ticket costs 2 yuan since October 7, 2007. From March 2008 the flat fare of 2 yuan will be replaced by a new charge by distance similar to the systems used in Hong Kong and London. There is a pre-paid card system (一卡通). There is a 20 yuan payment for the card. It can also be used for reduced-price bus rides.